Well, it’s past Halloween, but maybe there is still time for one more snake monster. In Chinese astrology, 2017 is the year of the rooster. English mythology features a monster which is half-snake and half-rooster: the fearsome cockatrice. The cockatrice had the head and torso of a chicken, but with dragonlike wings and a long sinuous serpent tail. It is sometimes conflated with the basilisk (although I think of them as different as, no doubt, do other Harry Potter fans). Various stories describe the cockatrice as being enormously venomous. The cockatrice was invented at the end of the 14th century and it experienced an enormous bloom of popularity in the England of the Tudors. Cockatrices were everywhere. they crawled all of over heraldry and pub signs. They were in work of Spenser and Shakespeare. They even crawled/flapped their way into the Bible as the enthusiastic King James translators put the newly-designed creature into the book of Isaiah for the Hebrew “tsepha” (which as far as contemporary scholars can tell was a very venomous fossorial creature, probably a viper). Why did the Elizabethans love the cockatrice so much? Well they were very poetic and imaginative people (if we take Spenser and Shakespeare as typical Elizabethans—and they are certainly the Elizabethans whom I am most familiar with). Additionally the style of the time was marked by proud swagger and poisonous disputes which stemmed from the great religious disputes of the time where everyone was trying to decide whether to be Catholic or Protestant and whether virtue and/or political advantage lay with one or the other. The mixed-up, chicken-brained, noisy, poisonous, beautiful, deadly cockatrice was a perfect mascot for such a time. Indeed, it may need to become make a comeback for our own time! The common onion (Allium cepa) is one of the oldest known cultivated vegetables: indeed, the onion goes so far back that now Allium cepa is known only as a cultivated vegetable. As with the cow, the actual wild version of this organism has been lost (although there are other edible allium species around the world which go by the name “wild onion”). 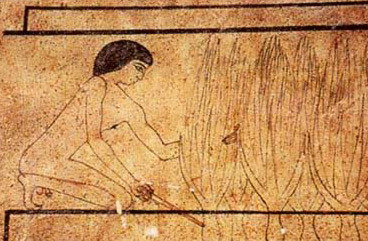 Common onions probably originated in Central Asia: the oldest archaeological evidence we have of onion farming puts the vegetables in Ancient Egypt 5,500 years ago, in India and China 5,000 years ago, and in Mesopotamia 4,500 years ago, however it is likely that they were grown as a crop long before then. 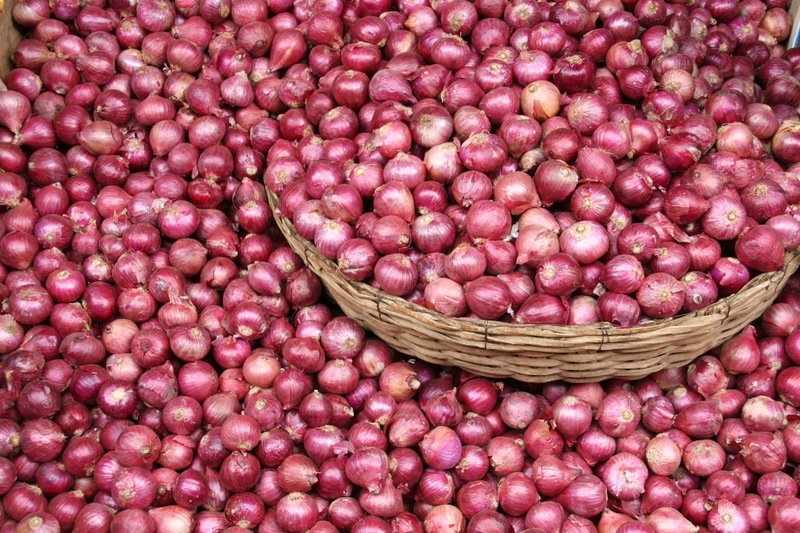 Onions are in the most ancient Chinese and Indian texts and likewise they are in the oldest chapters of the Bible. The classical civilizations of Greece and Rome were heavily dependent on onion cultivation. 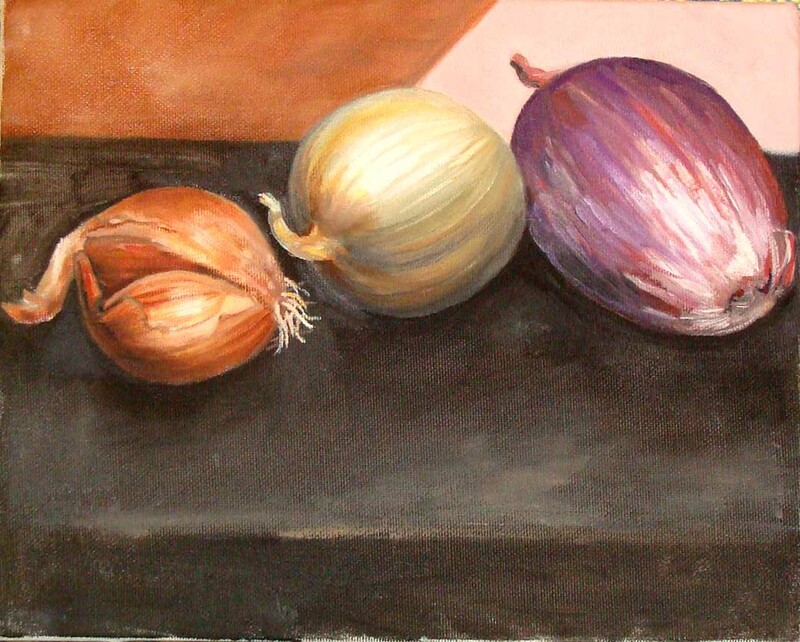 When Rome fell, onions became a staple of the medieval diet. Emmer wheat, bitter vetch, and bottle gourds have come and gone from fashion, but the onion is more popular today than ever. There is a huge bowl of them in my kitchen right now (and I cook them into pretty much every savory dish). 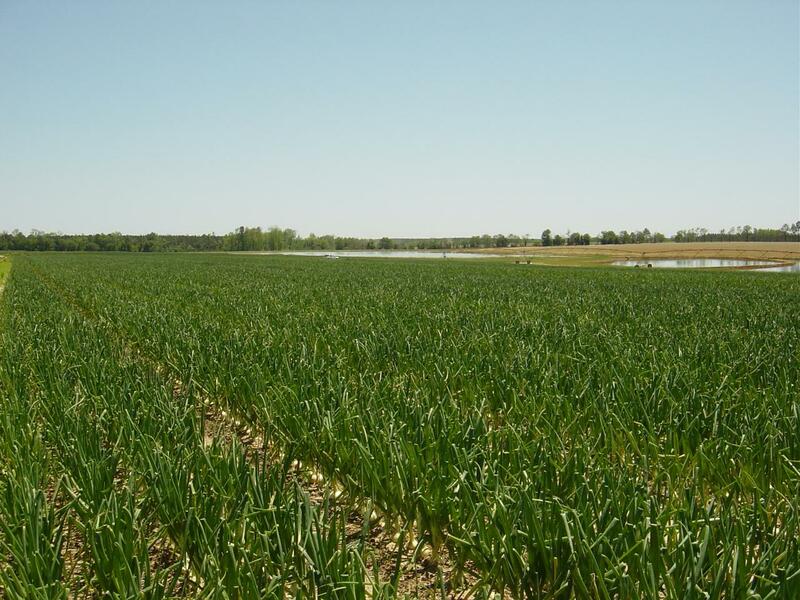 Onions are easy to grow in many different types of soil in many different ecosystems. They are also easy to store all winter and plant from seeds or bulbs. They can be dried or pickled for long term storage. They can be cooked in every conceivable way, or just eaten raw. Clearly humankind has an ancient relationship with onions and they have kept us alive in many a jam (myself definitely included). Indeed, onions are such a bedrock part of human culture, that we don’t too have much to say about them aside from boilerplate comments about their tear-inducing properties (which are caused by sulfenic acids released when onion cells are damaged). The ancient Egyptians thought of onions as sacred, and made them a part of funeral ritual and a symbol of the cosmos, but subsequent generations have become distracted by flashier vegetables, and pay the ancient onion little tribute (although I suppose there are arguments that onion domes, my favorite architectural flourish, are a sort of homage). I was hoping to feature some onion-themed deities or deep and troubling myths about these edible bulbs, but I haven’t really been able to find too many (although the satirical website is messing up my ability to search for material). So, instead of citing ancient literature or art, here is my own tribute to Allium cepa. This is a small oil painting which I made back in 2002. It pays tribute to the modest but very real visual beauty of onions. I painted the three main colors commonly available (after looking through all the bins for the right subjects for my still life like a crazy person). The painting makes me smile and it reminds me fondly of all the chili, curry, Chinese food, pasta, and porridge I have eaten which would have been thin and bland without this amazing vegetable. Hooray for onions! Only two nuts are mentioned in the Bible. 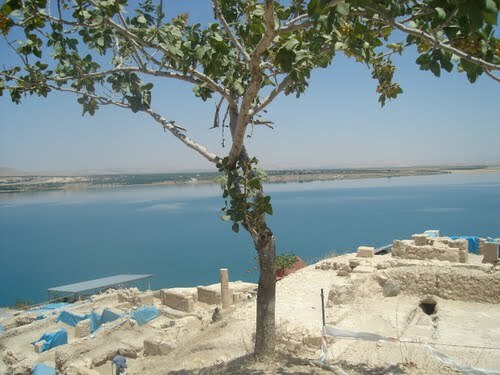 The almond is referred to frequently, but the pistachio (Pistacia vera) is mentioned only once, in Genesis (when Joseph’s starving brothers are trying to curry favor with an Egyptian official, not knowing that they are dealing with the brother they wronged). It is appropriate that pistachios are in the first book of the Bible, the nuts have been eaten by humankind since the depths of prehistory (and they were probably eaten by near-relatives among the hominids before our turn on the scene). Pistachio is a desert tree which is highly tolerant of drought and saline soil. The deciduous trees grow up to 10 meters (33 feet) tall. They are wild throughout the Middle East from Syria to the Indus valley–but their original range has been blurred by their popularity as a cultivated plant. Since they are one of humankind’s wild foodstuffs from before the invention of agriculture, human dissemination of pistachio seeds is a “natural” vector (although the very nature of that sentence casts the meaning of some of our implicit assumptions concerning nature into question). 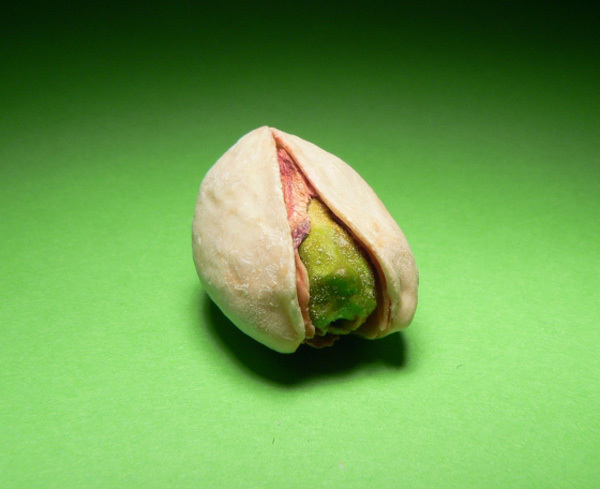 The route which Pistachios took into Western Europe is reflected in the etymology of the English word. The Online Etymology Dictionary summarizes it thus: “pistachio: 1590s, from It. pistacchio, from L. pistacium “pistachio nut,” from Gk. pistakion, from pistake “pistachio tree,” from Pers. pista “pistachio tree.” It seems Greeks first brought the seed westward, and its subsequent progress across Europe can actually be traced from classical history sources. At the same time, the nuts were also heading east along the Silk Road: Uzbekistan, Kyrgyzstan, and China are all major producers today. 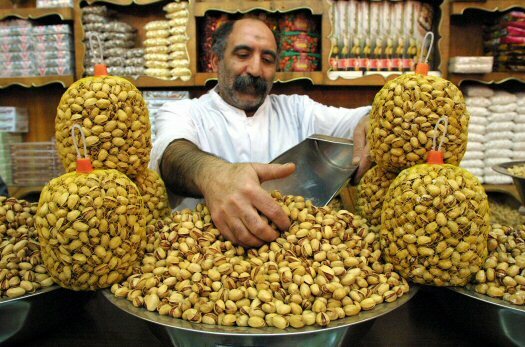 Pistachios originated somewhere in Persia, and Iran remains the largest producer and exporter of the nut. 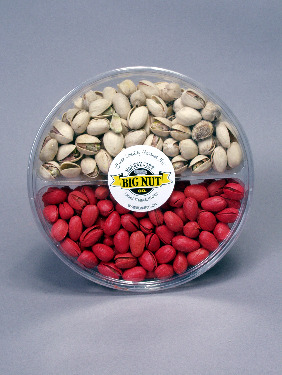 Speaking of exports, pistachios can be dangerous to transport in bulk containers. Because of their high fat and low water content, large quantities of the nuts can sometimes self-combust! Its long, long history as a human food aside, pistachios are delicious. The clam-like seeds pop open when they are ripe (although that is a human-selected trait) and the exposed seed has a brownish pink skin–which in turn reveals a pale creamy green flesh inside. Pistachios are members of the Anacardiaceae family, which includes sumacs and poison ivy. Like these scary relatives, pistachio plants (and seeds) can contain the oily irritant urushiol—so pistachios sometimes trigger allergies and rashes, however, dieticians assert that the seed is one of the healthier sources of protein and oils. 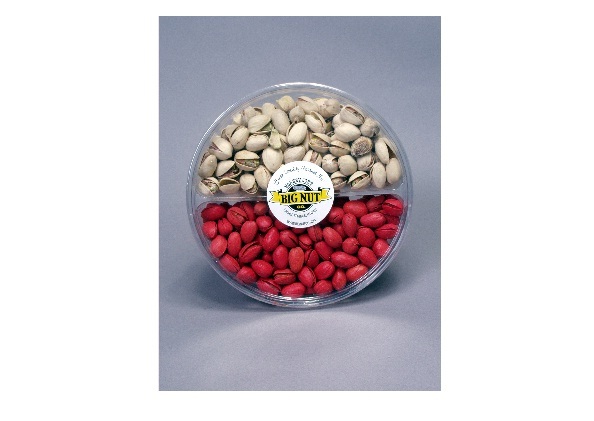 Traditionally pistachio nuts were dyed red to hide the blemishes made by handpicking, however such false color is no longer necessary (except to placate traditional markets). The pistachio seed has given its name to an especially pretty pastel green with pastel yellow undertones (the same hue found inside the nut). Pistachio green is one of my favorite hues. There is something calm, refreshing, and languorous about the green which speaks to leisurely mild summer afternoons. 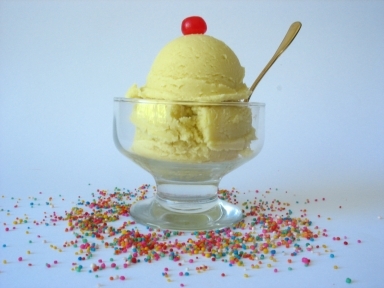 I hope you will excuse me, I would like to write more but I am going to go get a pistachio gelato!